NEW YORK – October 22 – Photo Plus 2009 is open now at the Javit’s Center in New York. As I mentioned, I’d be checking out the new Nikon D3s. It’s everything I hoped for and more. Imagine shooting very saleable pics at ISO 15,200! 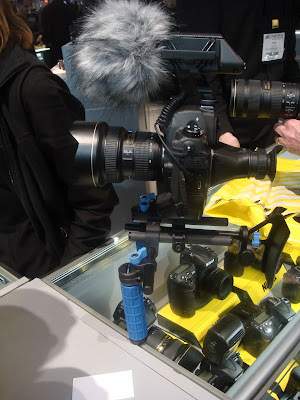 Since its got HD video capabilities, now everyone is coming out with accessories to turn it into a serious video shooting machine. Take a look here at the rig I got to try – a prototype shoulder/chest support rig by Red Rock Micro and Rode microphone with a wind-control fuzzy. What a combination! Under the “cute; but, probably-not-this-time” category was the Coolpix S1000PJ camera/projector combination. The idea is very cool as I reported earlier this month, but the projected image is not going to wow any serious photographers. I just don’t think many people will find dark enough environments to actually use the projection features. Yes it does work, I used it, but I wouldn’t rush out to order one.